Community working together to deliver faster more stable internet today! Once we have FTTH rolled out through Melkbosstrand we can start linking many community solutions to it for our adantage. For exsample, linked intelligent street security cameras on free FTTH connections, allowing us as a community to recognise and identify criminals before they actually commit the crime. Sign up for FTTH today and even if you are not in a fibre zone yet you can be connected to our network (AT NO EXTRA COST) through Stop-Gap WIFI untill your FTTH connection is made at your home. The FTTH Solution we have negotiated does not presently offer VOIP or transfer of your existing Telkom number. But once connected to FTTH you can just subscribe to a VOIP service provider to port your old Telkom number and you will be free of your landline. 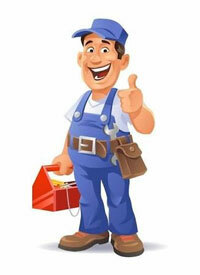 We will endevour to identify and list such service providers on the site in due course. While 123Net only provides Fibre Network support up to your home. If you need additional support setting up your home network, TV set top box at home or even help with your passwords and email set up DiGwork will be providing a technical support service as a monthly retainer or per hour service. A faster and more stable internet solution like FTTH (Fibre To The Home) offers us access to more communications based services. The Melkbosstrand FTTH Collective is a strategy begun by local Melkbosstranders that were tired of waiting for better internet services to be delivered by the ISPs. With the assistance of CommunitE we were able to get locals to demonstrate potential critical user mass for a FTTH solution provision in Melkbosstrand. We set up a small committee (Mark Simon, Leon Botha, Leon Breukelman and Johan van Tonder) to represent all those that subscribed to the Database on CommunitE.co.za, who then began contacting all the ISPs and FTTH infrastructure providers to negociate a FTTH solution for Melkbosstrand. Finally our call was answered by Mr. Milen Raykovski of 123NET and together we have structured a Community FTTH solution for Melkbosstrand. 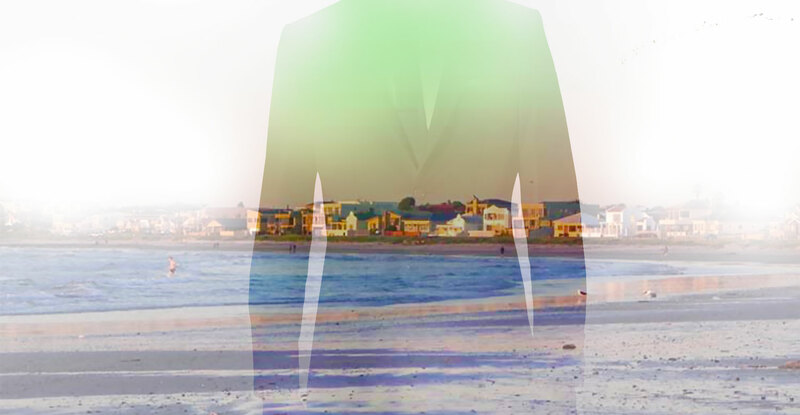 123Net Have set up a technical office in Melkbosstrand. 123Net will offer technical support in Melkbosstrand, but as they do not handle sales inquiries the office will be unmanned until we receive final planning clearance from the City to begin Fibre Rollout in Melkbosstrand. How long will I have to wait to be connected? Please do note that there might be a delay before service can reach your home. The normal waiting period unless the crew is already working in your street will be between two to three months to get cable to your home. 123Net will make a Stop-Gap Wireless link available from your home to their network as a temporary measure at a connection fee of R1,500. This will eventually not be an additional as fee the Stop-Gap WiFi connection fee will be credited back to your account as soon as the fibre reaches your home and can be used towards your Fibre connection fee or as credit against future payments depending on your package. (This Stop-Gap WiFi link is limited to 100Mbps and is only avalable if you have line of site to one of the WiFi towers). So please do remember to discuss this with your 123Net consultant when they contact you, after you have subscribed. Our Melkbos Community FTTH Collective solution provided by 123Net finally went live at the middle of June 2018. This was after an unplanned for two year delay while we awaited clearence from the CoCT. Connection to the subscribed homes will not occur as rapidly as we originally planned for, as the size of the team has been greatly reduced due financial constraints. 123Net Originally set aside R5Million for to finance a larger team to do the Melkbos roll out. But due to the extraordinary 2year delay awaiting our clearance at the CoCT, 123Net had to deploy these funds on other projects around SA. So the good news is that the project is still actively rolling out and connecting homes it will have to be done by a smaller work force and will not be as rapidly as we would have liked, this is unless 123Net manages to build up the fund reserve for the Melkbos FTTH project. All subscribers at Town Houses and complexes in Melkbosstrand need to use this websites subscription form to subscribe so that we can add you to the notice system and the logistics planning. All the logistics planning is done from the form filled in on this website. So if you have not subscribed here you will not appear on the planned roll out. So please do fill in the form on this website even if you have sent a contract to 123Net. THE STOP GAP WiFi SOLUTION WHILE YOU WAIT. The plan is to supply StopGap WiFi (in order of subscription, and dependent of line of site to tower reception) to all subscribers while they await cabling to their home. Now that our main connection has been made the stop gap connection will go live at the end of June 2018 and will be provided in order of subscription unless you have already been provided with a Fibre connection to your home. There are 400 WiFi kits available for Stop-Gap solution deployment. For more information please refer to the Melkbos Community Fibre Internet Collective on Facebook as Leon Botha will post weekly updates about our community fibre solution rollout there. We will be rolling out to streets and areas with higher subscriber density first. So get your neighbours to subscribe too. Remember Melkbosstrand is a special case and we need to be patient as 123Net is the only infrastructure provider that was willing to address our community needs and adhere to our strict requirements. THIS IS VERY IMPORTANT NOTICE PLEASE READ AND SHARE! Now that our FTTH solution has gone live in June, there are a bunch of people walking around Melkbos with clipboards pretending to be from our Community FTTH Collective or our infrastructure service provider 123Net. They are approaching home owners with forms asking for their personal details and bank details etc. These guys are not part of us nor have they been authorised to do this by us and are probably con-artists attempting to get your bank details for ID fraud purposes! WHAT HAPPENS WHEN IT IS TIME TO BE CONNECTED? If you have subscribed through our website and it is time for you to be connected up you will get a call from 123Net letting you know that your connection is coming up. This call will either be made by Milen or Mongli from 123Net. (they do have heavy Eastern European accents so do not be alarmed by this). No one will ask you for any up front payments before you are connected and THEY WILL NEVER ASK YOU FOR CASH! You will receive an email from 123Net with an invoice only after your connection goes live and that will be the first time you will need to pay anything. Which you can do through an EFT or a direct deposit. Please check the details on any invoice email you receive to ensure that it was sent from 123Net. If you are not sure you are welcome to contact us at any time. The Melkbos Community FTTH Collective is only working with 123Net and not any other entity at this time.So if you have subscribed for a Fibre connection through us, no other organisation or entity should be contacting you on our behalf OK! If someone does come to your house saying they represent either 123Net or the Melkbos FTTH Collective and want you to fill in forms with your banking details or any personal information on it or if they ask you for cash or upfront payment, they are most likely con artists, and we advise you contact SAPS imediately and get them to come and investigate! Please do warn all the members in your street watch Whatsapp group about this! Please note that we had a drop in network from our primary provider at 3:15 on 20-10-20018 throughout SA. The problem has now been resolved. Make use of the wireless connection to 123NET Fiber Network until you have fiber to your home. SHOW YOUR SUPPORT BY SIGNNING UP TODAY ! None of the major ISPs showed any interest in rolling out a Fibre To The Home internet solution in Melkbosstrand. 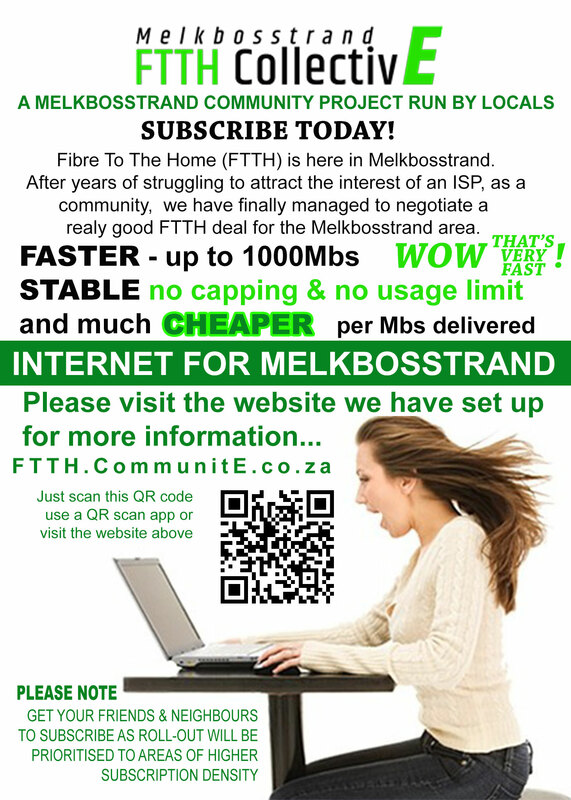 CommunitE initiated a campaign to sign up Melkbosstranders to a database to demonstrate that there is a critical mass of Potential FTTH Customers in Melkbosstrand. We have approached many ISPs over the past few years, with little to no success until recently when we reached 250 members on our database enough to demonstrate a viable critical mass for FTTH to be launched in Melkbosstrand. WOULD YOU LIKE TO INVEST IN THE MELKBOS FTTH COLLECTIVE PROJECT? to assist with your new website. Copyright © 2016 CommunitE. All rights reserved. 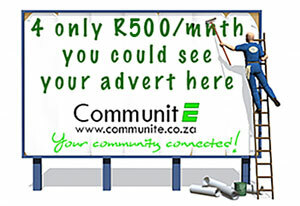 CommunitE is a Melkbosstrand Community initiative sponsored and managed by Mark Simon. All stock photos used on this site are the property of CommunitE.